The glossy Vendor Droid (Black, Droid Factory) is available in Flordia now, and it's pretty sharp. It's shiny, it's not something we've seen in a movie or TV show yet, and it looks like it could belong on the Death Star playset you'll probably never get. But I digress. Read on! 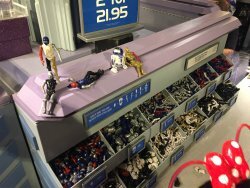 Check out the R2-C2 (Droid Factory)! Disney's take on Ziro's droid has different glasses, a different drink spigot, and uses that build-a-droid mold. Hasbro has one too as an Entertainment Earth Exclusive, and I'd say just get both - Ziro probably needs a lot of drinks. Read on! From the Disney parks, it's R5-P8 (Droid Factory)! It has a gun, lots of painted dirt, and a cartoony monster face on it. It's brilliant. You should get one. Read on! Hey, it's R2-D2! This is sold on a vintage-esque cardback with C-3PO at Disney theme parks. You've seen the mold before, but the dirt staining is new. Read on! It's new! (Thanks, Shannon!) The CZ Series Communications Droid (White, Droid Factory) is up for grabs at Disney parks, provided that you can find the pieces. It's similar to Hasbro's CZ-4 a few years ago, which is similar to CZ-3, which is what I'm saying this is for my display purposes. Read on! More! It looks like D-23, Halloween, Christmas, and whatever season BB-8 represents will be getting more exclusive figures at Disney parks and events. According to Vinylmation World, D23 will get R5-D23. Halloween gets a killer clear green R3-B0017. BB-8 will show up at Disneyland during D-23. R3-H17 is this year's Christmas Day of the Robot. Vinylmation World has more in a tweet. Adam gets another ulcer! New Protocol Droid Factory announced at Hollywood Studios! Vinylmation World posted some interesting stuff in the last day, including this tweet showing a new series of Protocol Droids launching, apparently, today! Exactly how many and which parts are there remain to be seen, so if anyone can catalog everything available so we can beg friends to help us out, that would be greatly appreciated. Additionally, three limited release action figures are making their debut including C1-10P “Chopper” from Disney XD’s animated series “Star Wars Rebels;” a two-pack featuring R2-D2 and C-3PO celebrating the 40th Anniversary of Star Wars: A New Hope; and a red Protocol droid, R-3D0, that was briefly seen in Star Wars: The Force Awakens. Happy Halloween! R2-B00 is - or was - at Disney theme parks as I type this for about thirteen spooky dollars. It'll be a beast to find them now that R2-H16 is shipping. I bet they'll skeleton of them. You could say it's pretty ghoul. Rather than torture more words in this intro, why not read on? And finishing up the 4-pack, it's R3-M2! This one has a new dome sculpt with a big silver band on the bottom which, unfortunately, helps highlight the inaccuracies of the Hasbro domes for the R3 droids over the past few years. Well. I guess we can look to redoing the rest of them. It's a great figure with wonderful deco, so check it out and read on! Silver on silver! R2-BHD has some nifty deco points, but is a little on the pale side. It's like the ghost of R2-D2. You can get it at or near Disney theme parks as I write this, so go ahead and do that were you so inclined. Read on! It appears Lucasfilm and Disney are going long on C2-B5 - at least three known action figures are available or are in the works so far. This 3 3/4-inch action figure is available now as part of a Disney parks exclusive Rogue One boxed set - one you can actually buy outside the park in the Downtown Disney compound. Should you get it? Read on! It took me longer to grasp than it should have, but I'm pretty sure R5-SK1 is a nod to Skippy, the Jedi Droid. If you don't know what that is, you missed Star Wars Tales - and that was a fine comic. This new droid is one of four figures in a new Disney parks exclusive droid pack for Rogue One, where one droid looks like one you probably have, another is coming with a big vehicle later, and the remaining two are seemingly brand new for this set. If you like droids, this is a good week to be you - we're going to examine the entire set. Read on!